Every year, American households throw away hundreds or thousands of dollars worth of food. Most of us try to buy only enough food that we can eat during the week, but we still end up with leftovers and spoiled produce that end up in the trash. This is an unnecessary waste of not only money but of the planet’s limited resources. What if I told you that there is a product available that allows you to store food three to five times longer? Would you be interested? Of course! The product I’m talking about is called a vacuum sealer. Vacuum sealers remove all the air from a bag with your choice of food in it and then seals the bag shut with the use of heat. Removing all of the air from the bags allows the food to stay fresh longer, and it also saves you room in your refrigerator or freezer. That’s a win-win combination. Sportsmen regularly use vacuum sealers to store fish and game that they worked so hard to get. They recognize the usefulness of an appliance that’s easy to use and allows them to store meats for years instead of months. People who like the savings of buying in bulk can also appreciate the usefulness of a vacuum sealer. Now you can divide up that 40-pack of pork chops into single meal portions and eat them at your convenience. Even dry goods like coffee, sugar, and flour will keep much longer when vacuum sealed for storage. If you think a vacuum sealer is an appliance that you’d like to have, I’ve got a great one to recommend. It’s the FoodSaver V3240 Automatic Vacuum Sealing System. This vacuum sealer is loaded with great features that make it one of the top vacuum sealing systems today. 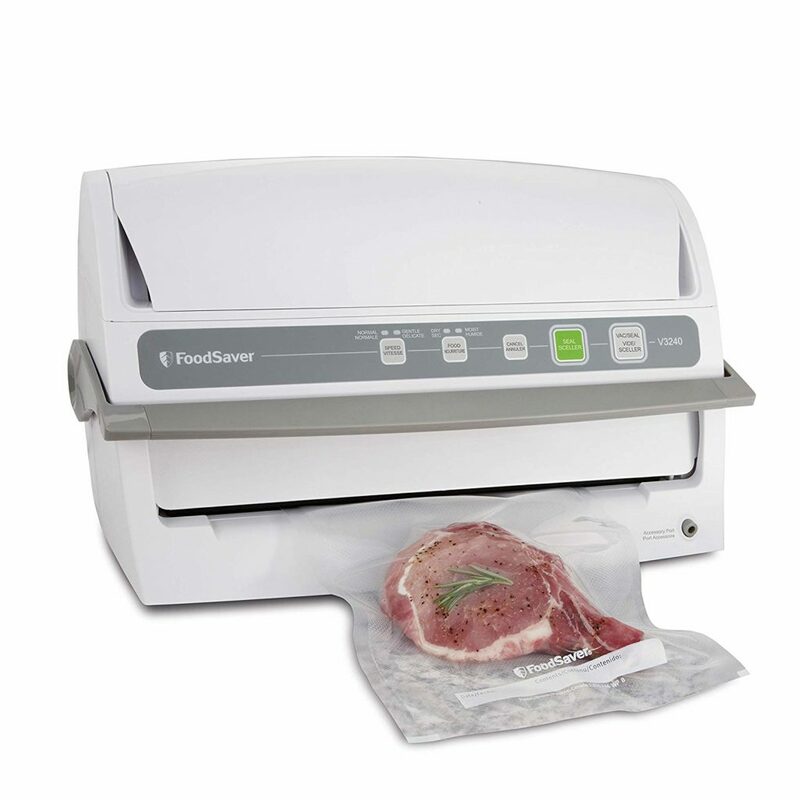 If you’re looking for a vacuum sealer that’s easy to use, the FoodSaver V3240 is the one for you. Many other vacuum sealers require you to press on them heavily with one or both hands to start the vacuum and sealing process. You then have to maintain this pressure for 5-10 seconds until the machine tells you-you can let go. That’s not the story with the V3240. To operate the FoodSaver, you simply insert the open end of the bag, close the lid, and press the vacuum and seal button. That’s it! The machine takes over, vacuuming and sealing the bag automatically. That makes this the easiest vacuum sealer to use on the market today. But wait, you guessed it, there’s more than makes the FoodSaver the easiest to use. You no longer have to hunt around for your vacuum sealer bags or rolls. The V3240 has onboard storage for your 11” wide rolls. You simply pull out the desired bag length and pull the bag cutter across to cut. You don’t need scissors or any other tools to use this vacuum sealer. It’s all included in one easy and convenient appliance. Another important item to consider in any vacuum sealer is the width of the sealing bar. You should always check to see how wide the bags or rolls you can use your vacuum sealer are. Most vacuum sealers will be able to handle 8” wide bags or rolls, but I recommend going bigger. Make sure your new vacuum sealer will handle 11” wide bags and rolls. This will allow you to use large bags when necessary, and smaller ones as well. The FoodSaver V3240 has a nice wide 12” sealing surface, so it can handle every vacuum bag and roll size available. The unique vertical design of the V3240 makes it much slimmer, which saves you a bunch of counter space compared to other vacuum sealers. As with any appliance or tool in your kitchen, cleanup is an important factor. When shopping for a vacuum sealer, see if you can determine how easy it is to clean. Reading through customer reviews can often be helpful in this area. The FoodSaver V3240 has one feature that makes it stand out from the rest. It has an easily removable and dishwasher safe drip tray that catches any liquids sucked out during the vacuum process. You simply dump the tray out and put it in your dishwasher, which cleans it up for the next time you use it. All of the other exterior surfaces are easily cleaned with a mild detergent and a damp sponge or towel. Cleanup is one area where the FoodSaver really stands out. Q: How do you seal liquids when using this machine? A: The best way to seal liquids is to freeze them in a bowl or container first, then place them in a vacuum bag and seal them up. This keeps the machine from sucking out the liquid when it pulls a vacuum. Q: Does this vacuum sealer have a bag cutter? A: Yes, you simply lift up the top cover and roll out the bag to the desired length. Then you slide the cutter across the plastic to make the cut. Q: Do you have to hold down the vacuum/seal button while it seals, or does it do it automatically? A: No, you simply press the button once and the machine takes care of the rest. Q: Will an 11” x 50’ roll fit inside this vacuum sealer? A: Yes, 11 x 50 rolls fit in the V3240 for your convenience. Q: Can I seal jars using this machine? A: Yes, you can seal jars using the separately available adapter. You can also reseal wine bottles using the special corks from FoodSaver. If you are in the market for a vacuum sealer, I highly recommend the FoodSaver V3240 Automatic Vacuum Sealing System. The simple one-button operation makes this the easiest vacuum sealer to use. I also like the space-saving vertical design and the onboard storage for your 11” rolls. The FoodSaver is plenty wide to handle any size you need, and it’s easy to clean up after you use it. When you combine all of its features with a great price, the FoodSaver V3240 is a fantastic buy.